Faith – Christian life is lived in relationship with God through Jesus Christ and, in common with other Christians, seeking to deepen that relationship and to follow the way that Jesus taught. As Christians we believe in justification by faith – that through our belief in Jesus as the Son of God, and in his death and resurrection, we can have a right relationship with God whose forgiveness was made once and for all through the death of Jesus Christ. As the creator of all that is, God loves us all with a generosity and faithfulness beyond our understanding. God invites us to trust that love and to live life with a faith which, though often confused or doubtful, is a journey on which we learn more about God’s reality, mystery and passion for us and all his creation. God’s reckless and sacrificial love, seen in Jesus, continues to breathe life into the Church and world through God’s Holy Spirit, comforting us and challenging us to live as authentic followers of Christ with faith, hope and love. Jesus said that people should be able to tell a follower of his by the love that person has for others. Christian spirituality teaches us that a human self is most itself when not being selfish. In his life on earth, Jesus upheld the dignity of each person he encountered, especially those who were marginalised, disliked, blamed and suffered forms of discrimination. 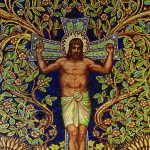 Jesus entrusted his future in the world to his friends, his followers, and therefore the Church now seeks to oppose all that desecrates humans and all that threatens justice, peace, the common good and the future of the environment. Christian faith believes that God has given us each the gift of being and that the gift we are asked to give in return is our becoming, who we become as human beings. God loves us just the way we are but God loves so much he doesn’t want us to stay like that. Our life is a consistent, sometimes painful, turning towards God’s truth and love. As well as baptism, Christians also read the Bible, gather to share bread and wine together in memory of the death and resurrection of Christ (known as the Eucharist, Holy Communion or Lord’s Supper), and pray. These four basic activities have remained constant and indispensable for the majority of those who call themselves Christians. They nourish and feed the life of faith so that we can be more faithful to our calling to imitate Jesus Christ in our own 21st century.